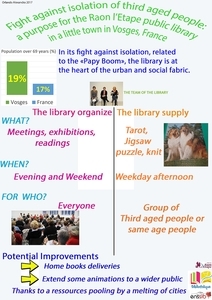 ORLANDO, Alexandra (2017) Fight against isolation of third aged people : a purpose for the Raon l'Etape public library in a little town in Vosges, France. Paper presented at: IFLA WLIC 2017 – Wrocław, Poland – Libraries. Solidarity. Society. in Session 112 - Poster Sessions. My abstract searches to highlight the actions of the Raon l’Etape public library against isolation of the third-aged people.Raon l’Etape is a little town of 6500 inhabitants, located in Vosges, in the big new region « Great East » in France. This department notices an important ageing population. The population aged of 69 represent 19% of the population in Vosges, against 17 % nationally. This event is related to the papy-boom.In this demographic context, the library is at the heart of the social fabric and the library’s team is particularly aware of this topic. Consequently, innovative activities take place: - The library organize numerous events with exhibitions, readings and lectures for everyone. - But some events are organized for associations only. It could be extended toward a more large public. - The library is a place of living and offers to old people to come and play cards, above all the tarot and the pinocle, on Tuesday and Friday afternoons, and also to meet around knitting. This people went in group. - Besides, somes jigsaw puzzle are provided to the public. That’s why, people of all ages can doing them. They help sometimes anoter person. It enables informal intergenerational meetings. The future « intercommunality » will allow a mutalization of means. According to librarians, it will give more opportunities to fight against isolation. Another project can be born in this department : the book home delivery . To maintain a link, it is for people who can’t move and stay at home. Consequently, they can talk with somebody and keep the pleasure of reading.